prehysteries of new media: >> Stephen Wozniak, "Homebrew and How the Apple Came to be"
>> Stephen Wozniak, "Homebrew and How the Apple Came to be"
Stephen Wozniak is the designer of the Apple II computer and cofounder of Apple Computer Inc. Without computer clubs there would probably be no Apple computers. Our club in the Silicon Valley, the Homebrew Computer Club, was among the first of its kind. It was in early 1975, and a lot of tech-type people would gather and trade integrated circuits back and forth. You could have called it Chips and Dips. We had similar interests and we were there to help other people, but we weren't official and we weren't formal. 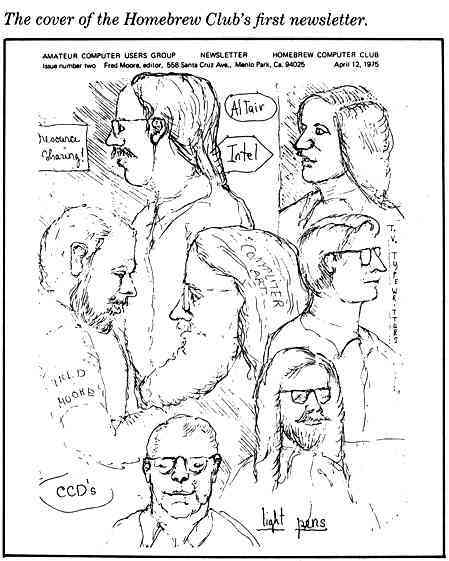 Our leader, Lee Felsenstein, who later designed the Osborne computer, would get up at every meeting and announce the convening of "the Homebrew Computer Club which does not exist" and everyone would applaud happily. The theme of the club was "Give to help others." 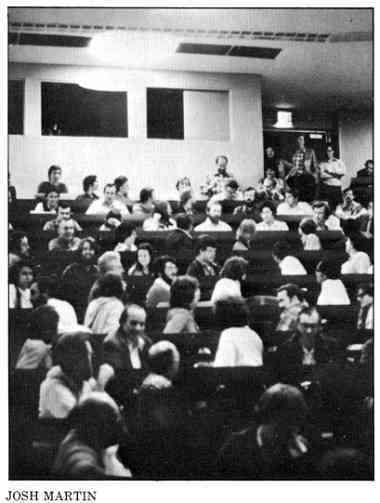 Each session began with a "mapping period," when people would get up one by one and speak about some item of interest, a rumor, and have a discussion. Somebody would say, "I've got a new part," or somebody else would say he had some new data or ask if anybody had a certain kind of teletype. During the "random access period" that followed, you would wander outside and find people trading devices or information and helping each other. Occasionally one guy would show up and say, "Is there anyone here from Intel? No? Well, I've got some Intel chips we want to raffle off." This was before big personal computer firms and big money considerations. There was just one personal computer then, the Altair 8800, based around the Intel 8080 microprocessor. The Apple I and II were designed strictly on a hobby, for-fun basis, not to be a product for a company. They were meant to bring down to the club and put on the table during the random access period and demonstrate: Look at this, it uses very few chips. It's got a video screen. You can type stuff on it. Personal computer keyboards and video screens were not well established then. There was a lot of showing off to other members of the club. Schematics of the Apple I were passed around freely, and I'd even go over to people's houses and help them build their own. The Apple I and Apple II computers were shown off every two weeks at the club meeting. "Here's the latest little feature," we'd say. We'd get some positive feedback going and turn people on. It's very motivating for a creator to be able to show what's being created as it goes on. It's unusual for one of the most successful products of all time, like the Apple II, to be demonstrated throughout its development. Today it's pretty obvious that if you're going to build a billion-dollar product, you have to keep it secret while it's in development because a million people will try to steal it. If we'd been intent on starting a company and selling our product, we'd probably have sat down and said, "Well, we have to choose the right microprocessor, the right number of characters on the screen," etc. All these decisions were being made by other companies, and our computer would have wound up being like theirs-a big square box with switches and lights, no video terminal built in . . .
We had to be more pragmatic. The 6502 microprocessor, for instance, was chosen for one reason only. It was the first one to sell over the counter for $20. The 8080 cost $370 at the time, and you couldn't get it at any surplus stores. You had to go down to a distributor, and they made you feel like you had to be a company with an account. It wasn't set up for hobbyists or experimenters. Steve Jobs was a friend of mine from high school. We were introduced because we had two things in common: electronics and pranks. It turned out that he had a tremendous drive to start a company. He had worked at Atari and had become friends with some of the key people there, including Nolan Bushnell, the founder. Nolan was his idol. Steve wanted to have a successful product, go out and start selling it, and make some money. He also had excellent product ideas for the upcoming home personal computer. To produce the Apple I, Steve and I formed a partnership. We didn't sell very many Apple Is the first year. We built them at night in our garage. At first we expected to sell circuit boards at the Homebrew Club: just put in your own chips and it'll work. Then we got a $50,000 order from a local store and we were in heaven. The trouble was how to get the money to build a hundred computers-they might cost over a hundred dollars each to build. Steve went to a local parts supplier and talked them into giving us a lot of parts on thirty days' net credit. It was very unusual for them to give us credit, because we didn't own anything. We didn't own houses. We didn't even own our cars. But Steve is very persuasive. We'd get the parts and then stuff them into the circuit boards, have them soldered, get them back in the garage and test them. And we could turn the whole cycle around in ten days and get paid. It worked really great because we had only one level of management. We got our names established. The computer magazines started carrying lists of all the microcomputers coming out, and they'd describe all the characteristics-how much memory, which processor, was it assembled or was it a kit, what was its price. The Apple I had a good appearance, and we were always at the top of the lists because they were in alphabetical order. After the Apple I was out, we tried to add new features. We thought about color and maybe some high-resolution graphics. I found ways to optimize and combine different parts of the circuits and make things with fewer chips. It's great to show off at a club that you use fewer chips than someone else. I did it for no other reason. The Apple II came out of trying to improve the Apple I. From thinking out a way to make it with half as many chips, you could have a much better product. It was faster, it had color, it had high-resolution graphics, it had mixed modes on the screen with text. A lot of neat features made it look like this might be a nifty product. It turns out that some of its best features were inspired by what little experience we had. Steve and I had done a game for Atari-Breakout for the arcades-before games were on microprocessors. We were running the Apple II down at the Homebrew Club, so I thought it would be neat if you could write Breakout in BASIC. I added graphics mode commands to the Integer BASIC I was writing. Breakout needs paddles: I had to add a little circuitry for paddle and push button. You need sound: when the ball hits the bricks, ping; when you lose, ehhhh. So I put a speaker in. All of these features were basically just to play one game. These turned out to be common features for the personal computers that have come out since that time. We weren't quite the first to offer a keyboard and video output, but we were close. We were the first to offer built-in BASIC. We made the first built-in cassette port so you could use a cheap cassette recorder to load your programs in and store them. We had started to set standards for what have come to be known as low-cost personal computers. Just about the only argument on product design Steve and I ever had was on the number of expansion slots. I wanted eight and he wanted two. I was for eight simply because I'd been around minicomputers that had a lot of extra function boards plugged in. Steve figured people would only use maybe a printer and a modem, and that was it. Fortunately we went with eight, because the Apple II's expandability was important to its success. When we geared up to manufacture the Apple II, it looked like I'd have to leave my nice secure job at Hewlett-Packard. I thought about it and said no. I just loved going down to the Homebrew Computer Club, showing off my ideas and designing neat computers. I was willing to do that for free for the rest of my life. Steve got extremely anxious. He got all my friends and relatives to start phoning and tell me why I was making a mistake. Finally one of them called and said you can start a company, remain an engineer and also get rich. I decided that you can start a company and make money. Once I got the consciousness right, it was easy to quit HP and take this big risk. We got our first ad agency and began discussing who we were and what our product was and how we would market it. Of course, to a marketer Apple was an odd name. It came from the days when you picked an interesting, fun name for a company. You do that when you're on a hobby basis. The ad agency kept telling us the name had to be changed. We had to have a name that suggested technology, number crunching, calculations, data bases. We took the attitude that Apple is a good name. Our computer would be friendly-everything an apple represents, healthy, personal, in the home. We had to hold our ground on that one. The agency designed our color logo. (Our original logo was Newton under the apple tree.) Steve twiddled the colors around and kept a rainbow orientation. One of the most complete listings of user groups can be found in the annual Classroom Computer News Directory. Originally intended for teachers, this 200-page directory provides a wealth of information for general users on all aspects of computing, including sets of guidelines for hardware and software selection as well as a complete Yellow Pages of computer services and products. The directory is available from Classroom Computer News, 341 Mt. Auburn St., Watertown, MA 02172. Telephone: (617) 923-8595. We introduced the Apple II at the First West Coast Computer Faire. The first computer shows were informal, not like the professionally oriented shows we have today. They were more an outgrowth of computer clubs. We got a lot of our initial support from these clubs. I started speaking at them whenever I was invited, and I've been doing it from that day on. I travel at my own expense because I think it's exciting to tell the story of how our company sprang up from a club. Our success was due to a number of factors. First of all, we had never manufactured computers before. We couldn't look back and say, "Here's how computers earned a lot of money in the sixties and seventies, that's the style to do." All we thought about was what was going to work out great in our own homes. Our motivation was what would be good in the end. If there was a known formula for what would make a successful product, and what would make a billion dollars, all the big companies would have jumped on it. All these companies were a lot smarter than us. What we had was luck. We did the right things with the right coincidences of timing and the right people in the right place. We had a lot of interest and enthusiasm. The rewards that drove us were all intrinsic. The computers were being put together to show off at a computer club: "Look at this. I put in these neat commands." It's not like you get a better salary, or a better title, or more respect at work, or a new car. We had the autonomy of creators. We could decide what was going to make a neat computer. We could implement it, and we could show it off. We also had excellent feedback from our peers. Back then, the small computer scene was based on the belief that we were all on top of a revolution. Everyone attending the club in 1975-76 knew there was a big computer revolution occurring and the rest of the world wasn't aware of it yet. That's why there was so much excitement and spirit. We were finally going to get control of our own computers. It wasn't a million-dollar thing that belonged to the company you worked for. This big thing that had so much value, and that we wanted to use and control, we finally were getting close to. Look at how many companies have sprung out of our Homebrew Computer Club. At last count, it was something like twenty-one! We managed to bring the computer revolution home. I might get electrocuted. This particular anxiety was a favorite among our forefathers, who trotted it out when they were confronted by inventions like the light bulb and telephone. Rest assured: the computer keyboard's electrical current, about equal to that of a cordless electric shaver, is just too low to cause harm. I'll never understand how to operate a computer. Nowadays, turning on the machine usually involves no more than flipping a switch and loading in a program. And in place of those undecipherable symbols that trigger long-forgotten fears of fractions, most programs now use English as the means of communication. Many of them also have pick-and-choose menu formats to guide you through available choices. I might break it. You can't get that rough with a computer simply by typing on it and turning it on or off. Home computers are akin to any store-bought item: they vary in durability according to manufacturer, model, and wear and tear, and they have to be treated with a bit of respect. I have no sympathy for the user who douses his machine with coffee and complains when it prints out Martian dialect. The machine might lose my work. Wiping out a sentence or two is always a possibility, as is destroying everything you've entered over the last five years. But you can guard against such losses by watching your delete commands and taking proper care of your floppy disks. Most important is that well-known data processing axiom: "Back it up." It takes no time at all to copy a program or data from one disk to another, thus assuring yourself of the ability to restore any work that gets lost along the way. I might lose the privacy of my data. If you have the traditional stand-alone system, with no outside machines attached, your data is as safe as it would be on a piece of paper. For added security, don't let anyone read over your shoulder when you enter your data or password and remove the disk when your session is finished. If your computer is hooked up via modem and telephone line to a friend's machine, and if you happen to be paranoid about wiretapping, you can invest in encryption hardware or software to encode and decode your communications. As for the suspicion that someone will phone your computer and search through your disk-based data while you sleep, just keep the power turned off; no one has yet found a way to turn on a computer by remote control. Computers have more capability than I need. This is also true of pencils, but how many people worry about not using them to draw works of art or create literary masterpieces? Personal computers range from relatively inexpensive units to quite elaborate affairs and offer a wide array of functions. Chances are, as you and your computer get used to each other, you'll expand your horizons and purchase software packages that increase your machine's versatility. Using a computer will lower my status. This illusion circulates among office personnel who are actually afraid of looking silly as they try to master the new technology. If computers are that alien to you, especially if you're older or set in your ways, a gradual introduction is probably best. Sympathetic private tutoring can prevent loss of face before co-workers and convince you that business computers may enhance your status. I might lose the ability to do things on my own. A computer is not an electrode-studded brain sapper, nor is it a device that turns users into Einsteins. As a tool, the computer simply helps you accomplish your work with maximum efficiency and expands rather than hinders your own capabilities. Erasing typewriter errors by hand, for example, impedes the creative act of writing, whereas correcting text on a personal computer is a pleasure. As for mathematics, is it more productive to hunt for a multiplication error or to be freed to explore new formulas? A computer is mathematical and not for creative types. This view is held by artistes, literary denizens, and just plain folks with a morbid fear of numbers. The good news about computers is that if you don't want to play with accounting or physics, you can buy a word processing program to help with your writing, a music package to aid in composing, or a knee-slapping outer-space game to match your wits against.